I am buried under a mountain of tie-dye. Rainbows, Midnights, Purples, Blues, Oceans…those are the color palettes that are dyed. I have started the Greens. My daughter (my partner in the tie-dye business) reads my blog and I want her to know that I have started the Greens. I dyed that one Extra-large T-shirt with the light beer on it, so the Greens are definitely started. The Forests, Goldens, and Fruities are still to come. My daughter has tied the Forests. She still needs to tie the Goldens and the Fruities. She would have finished the tying by now, but she has been helping me with the dyeing. Our normal division of labor is that she ties and I dye. 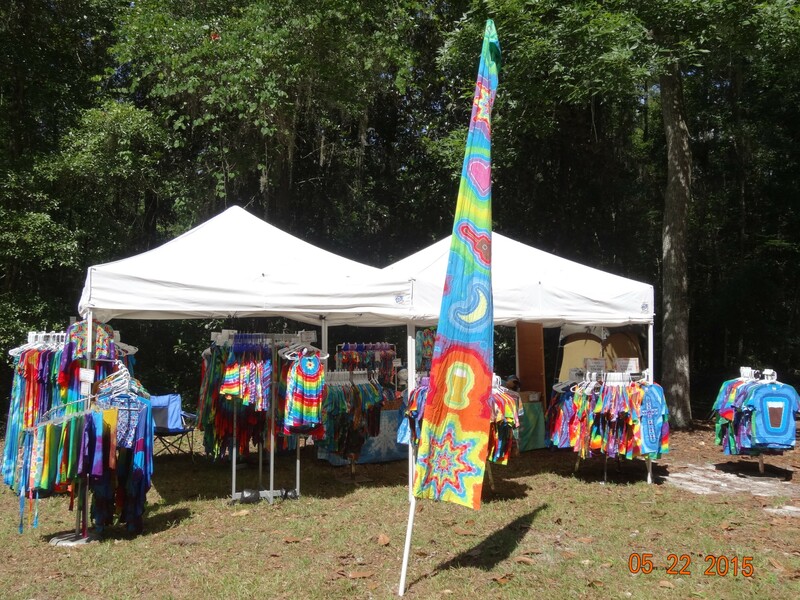 The dyeing takes longer than the tying, though, and this year we got a late start on the big tie-dye push for the Florida Folk Festival. It’s amazing how much more we can get done when my daughter helps with the dyeing. When she’s here helping, I can get up and mix more dye without thinking that nothing is getting done. I know the mixing is part of the job, but it feels like just an annoying thing I have to do before I can get back to doing the job. It isn’t quite so annoying when someone is still dyeing while I’m mixing. In a more perfect world, we might have a minimum-wage minion doing the mixing, but in our world, that minion would be making more money than we are. We are our own minions. We do the planning. We do the designing. We order the blanks and the dyes and the chemicals. We pre-wash, dry and fold every cotton blank that comes in and we store them all until we need them. 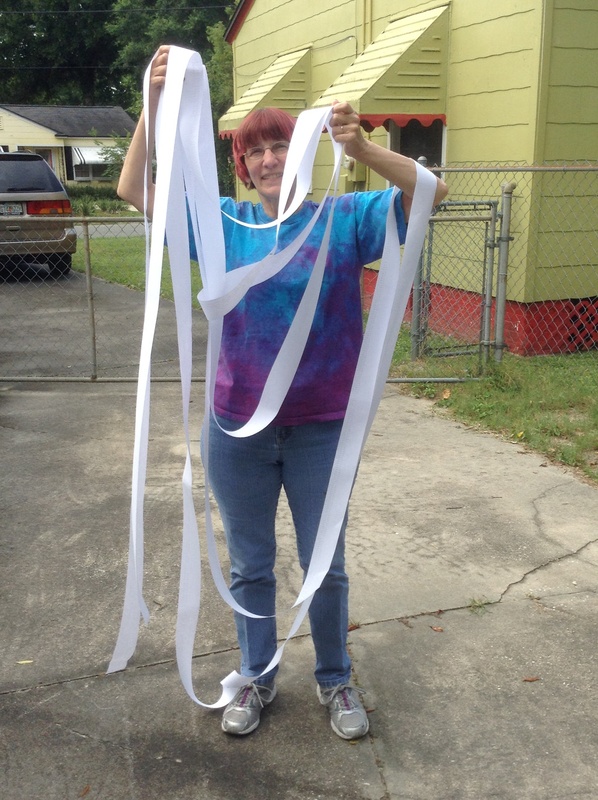 Before a big event, we make lists of all the things we need to dye. We pre-soak them and tie them and dye them. 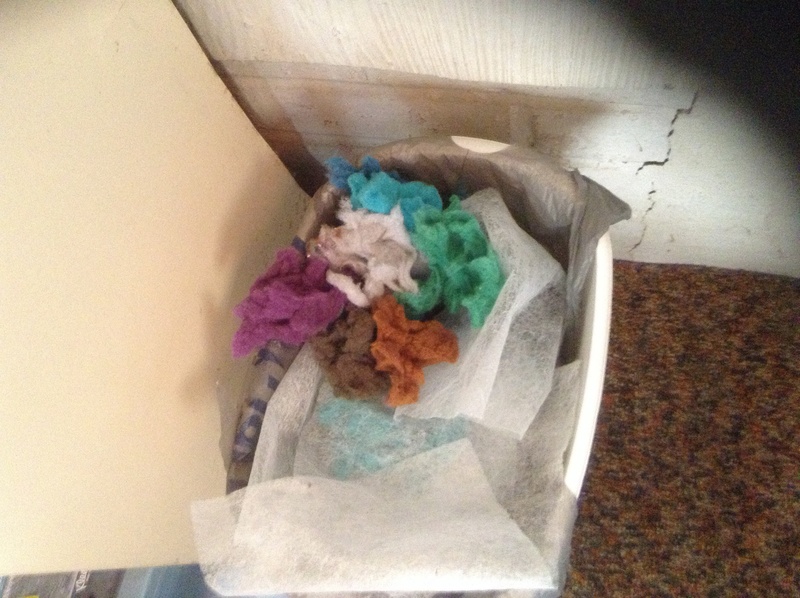 We wrap them up and leave them alone for at least twenty-four hours and then we rinse them and wash them and dry them. I hate to burst anyone’s bubble, but making tie-dye is a lot of work. I like it a lot better than office work, but it’s still work. It’s not just making rainbows. An awful lot of it is just laundry. Load after load after load of very colorful laundry. Sigh…my weekly blog post seems to have turned into a rant. It’s late. I’m tired. I am buried under a mountain of tie-dye. 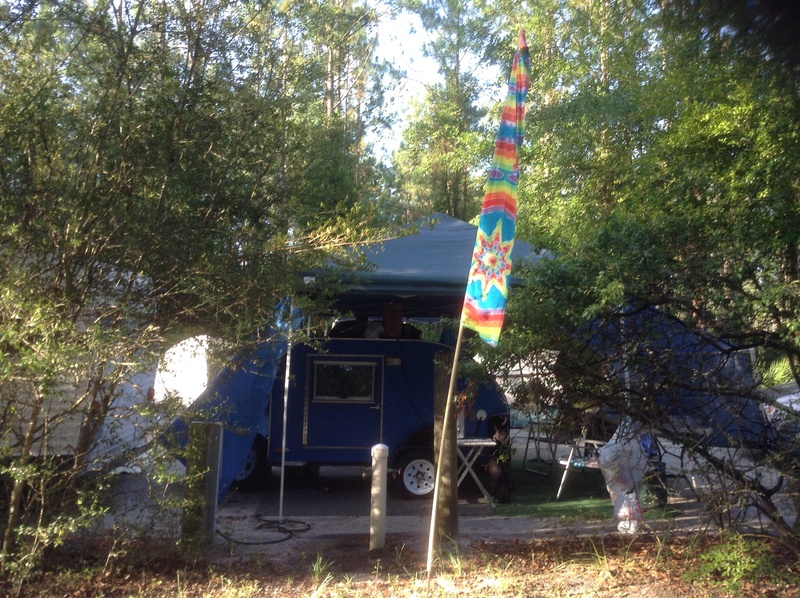 This entry was posted in Uncategorized and tagged crafts, Florida Folk Festival, self-employment, tie-dye, work on May 13, 2015 by releaf1954. When I went to bed last night, I was thinking about today being blog day and wondering what I could possibly write about. Then I went to Facebook this morning and found posts and private messages letting me know that my former brother-in-law had passed away in the night. He and my sister divorced years ago, for very good reasons, but you just don’t forget someone who has been part of your family for years. My heart goes out to his children and my heart remembers the good times. He and my sister formed a musical group and invited me to sing with them. 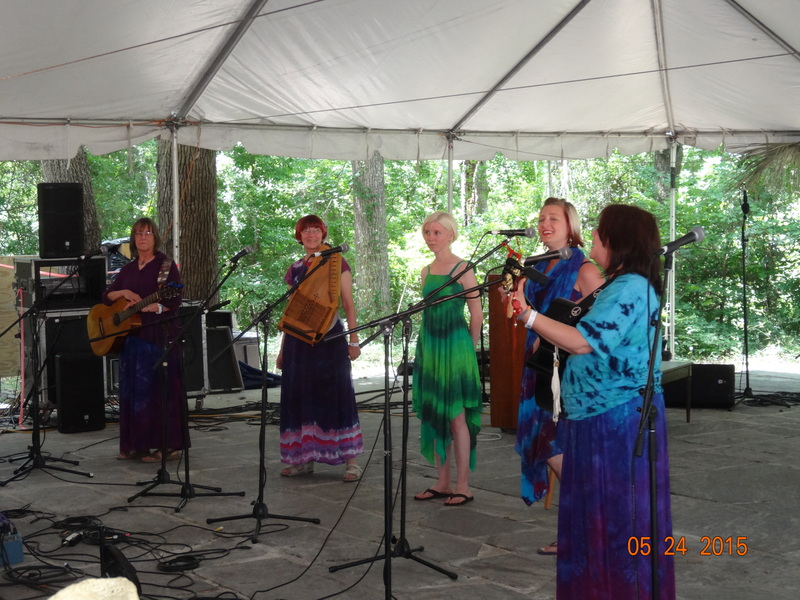 The first time this group wanted to participate in the Florida Folk Festival, the one way that was offered was with a set on the Gazebo Stage, a stage dedicated to Florida music. We agreed to do a twenty-five minute set of songs about Florida even though we didn’t have that many Florida songs in our repertoire. My brother-in-law sat down and wrote some. They were good. They were astonishingly good. I will never forget learning those songs and I will never forget singing them at the Florida Folk Festival, first on the Gazebo Stage and eventually on the Amphitheater Stage. We were able to do that for several years and they were good years, at least for me. He was a phenomenal musician and songwriter and I feel privileged to have had those experiences. My first trip to the Will McLean Festival was with that group. My only trip to Suwannee Springfest was with that group. I remember that he learned about the nickname one of my older brothers had called me in childhood and became only the second person who ever got away with calling me that. He still called me that the last time I ran into him, shopping in the local Walmart, years after he and my sister split up. My brother passed in 2008, so that’s a nickname I will not be hearing again. I would not have thought that would make me sad, but it does. I remember Halloweens and Thanksgivings and Christmases, times when he was there, part of the family, adding his special sense of drama and whimsy to the proceedings. My husband and I used to host an ornament making party every Christmas. There’s a glittery eyeball that still hangs on my tree every year, thanks to my ex-brother-in-law’s creativity. I remember one Christmas when I was strolling a shopping center with my children and we ran into Santa Claus. My kids were impressed when Santa addressed them by name. My brother-in-law was a “helper” that year. I know the man was not perfect. He had flaws. He had issues. He and my sister could not stay together, but he was family for fifteen years and we will not forget him. There were plenty of good times and we will remember those. Rest in peace, my brother-outlaw. This entry was posted in Uncategorized on May 6, 2015 by releaf1954.